RAID (redundant array of inexpensive disks) allows users to configure multiple physical hard drives into one single logical drive. RAID holds two major benefits. It increases the performance, and also provides protection against data loss from drive failure. RAIDs used to be expensive and the only ones who could afford it was software companies with dedicated IT departments. But now, things have changed. Nowadays, most desktops run on motherboards that support RAID. Windows 7 even provides users with a dedicated software which does not need a special hardware at all. Thus, RAID is now within the reach of common users. All you need is the right knowledge about RAID, and you are all set to use it for maximum benefits including RAID data recovery. This setup splits or stripes data across two or more drives and thus increases the hard drive performance. For example, if you write a 200 MB file across this RAID 0 setup, and you have two physical hard drives, then 100 MB of the file would be written on one drive and the remaining 100 MB on the other. When the computer needs to read that file, it would again read half from one drive, and the other half from the other drive. This process is significantly faster than reading a 200 MB file from a single drive. However, the chances of data loss are also significantly more in this RAID 0 setup. This is because, if one of the multiple drives fails, then the whole data, divided between drives, is also lost. RAID 0 setup is prevalent in high-end gaming PCs, and also graphic design workstations. This setup reads and writes data to pairs of drives, which is often referred to as mirroring. In a RAID 1 setup, the computer writes the same data to each of the two drives, so that should any one of them fail, you can continue your work through the other one. So, if you set up two 1TB hard drives in RAID 1 setup, it offers you a viable 1TB of usable space, not 2TB. You can have as many pairs of mirrored drives as you wish, provided your RAID controller allows to have them. Thus, with a RAID 1 setup, you have a greater speed and higher chances of RAID data recovery. However, the usable hard disk space is reduced to half. RAID 5 uses a minimum of three physical disks. This setup writes and reads from all the three drives equally. The redundancy or parity information is also stored equally among the three drives. Parity information or parity data is a smaller amount of data which is derived from a larger amount of data, and which can accurately describe the larger data. It is because of this parity information, that if one of the hard drives in a RAID 5 setup fails, you have a chance of recovering most of the data through RAID data recovery, because of the parity information stored in the two other drives. RAID 5 uses approximately a third of the disk capacity for storing parity data. As data is read from multiple disks, performance is boosted. Thus, with a RAID 5 setup, you get a superb boost in performance and also a fair amount of data redundancy. A RAID 10 setup is basically a blend of RAID 0 and RAID 1 setup. RAID 10 or RAID 1+0 divides data between primary disks (using striping) and mirrors this data to secondary disks. Thus, you need a minimum of 4 physical drives for a RAID 10 setup. This setup thus provides users with the benefits of both RAID 0 and RAID 1 setups. With RAID 10, you get both a boost in performance, as well as in data redundancy. There are a few things to consider if you want to set up RAID on an existing system. For an existing system, you first need to have a full backup of your data, and a fresh image of your OS installation. This is to ensure that if somehow things go wrong, you still have all your data as well as an OS image in hand. However, for installation of RAID on a fresh new PC, you don’t need this. In that case, move on to the next sections. With hardware RAID, a hardware device in the computer does all the controlling work. For example, if you have a hardware RAID installed on your PC, and wish to set up two disks in a RAID 1 configuration, the hardware itself would do all the job. All the RAID works including mirroring and dividing the data across hard drives are performed by the RAID controller itself. With software RAID, the controlling work is handled by the software. Windows integrated RAID functionality into their OS, starting from Windows XP. With Windows RAID, you can use the drive manager to create arrays, so that there is no BIOS to configure. Mirroring too is easy, and you can create them from existing volumes, or you can mirror individual partitions. 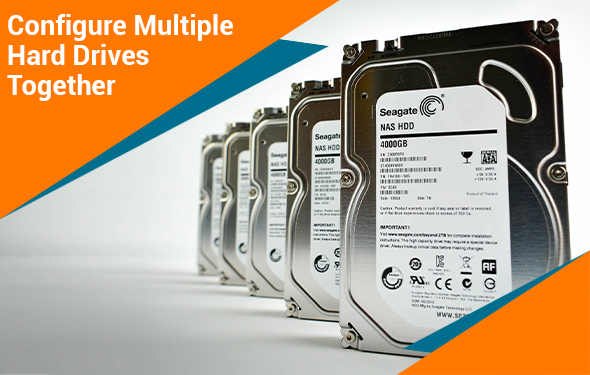 In addition to the hardware or software controllers, you’ll need two or more disk drives. Thus, with the drives in place, and the hardware or software handy, you are all ready to set up RAID and make the most of RAID data recovery. What is the benefit of using RAID? Ans: The major advantages of using RAID are superior performance and higher protection against data loss in case of hard drive crashes. How many disk failures does RAID 5 support? Ans: A RAID 5 setup ensures data and parity are distributed among three drives. So, even with a 6-drive system, a RAID 5 can recover from a single disk failure at a time. How many drives are needed for RAID 10? Ans: The minimum number of physical drives needed for a RAID 10 setup is 4. Ans: BIt-level striping is used in RAID 2, and different hard drives store the sequential bits.